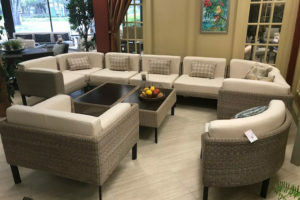 If you are looking for some new outdoor patio furniture, you are likely overwhelmed by the sheer amount of options. Resin wicker might just be the best option for your outdoor furniture, and we have a few different reasons as to why that is the case. 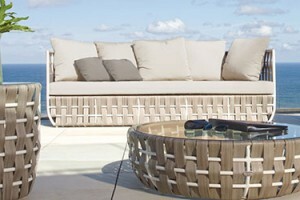 One of the reasons that resin wicker is also called ‘all-weather’ wicker is because it delivers on that promise. It can stand up to the heat and the cold, and still retains its original color and shape. 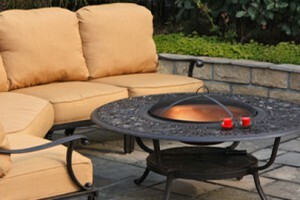 This is what makes it some of the best patio furniture on the market. Given the ‘all-weather’ wicker moniker, resin patio furniture is mold and mildew resistant, waterproof and rust resistant. This is because of the polyethylene in the wicker. That is why you can leave your resin wicker outside during the rain. Resin is usually built around a powder coated aluminum frame, where the wicker is hand woven over it. This makes the furniture lightweight, but still sturdy enough to last. Many of the finer details of resin furniture are possible because of the wicker details, including double woven and half around details. We have a wide range of different resin options available. 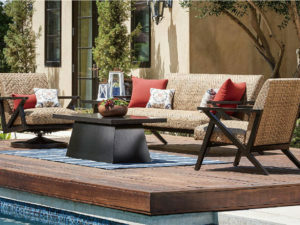 Oftentimes your patio furniture is going to fade because of the UV rays, but resin wicker has UV protective inhibitors. This means that your resin wicker is going to have the same vibrant look that it did the day you brought it home with you. Wicker is less susceptible to fading and more durable. Because of how amazing resin wicker stands up against the elements, it is less likely to have problems with wear and tear. This is not going to show any warping or bending. When we compared it to the traditional counterpart, resin wicker is much more durable. You are not going to have a great of maintenance if you buy resin wicker patio furniture. In order to effectively removes surface dirt, you only need to hose it down with water. If you refuse to do even that, you can always buy covers as well. Not only does resin wicker look appealing and offer a great deal of sturdiness, it is also better for the environment. You can keep your carbon footprint smaller and keep our landfills emptier by using resin wicker that is made from recycled material. This is a smart choice, both in the ways of quality and environment. When you compare resin wicker patio furniture to aluminum or teak options, resin is still going to offer you an amazing deal. Even with the added protection from precipitation, weather resiliency, and low maintenance. If you want to see the difference in price, just come check out our collection for yourself.